It’s easy to use: just pour batter into the pan and place divider in before baking! The rack aids in cooling and brownie removal! The pan can be used without the divider, as a regular baking pan! 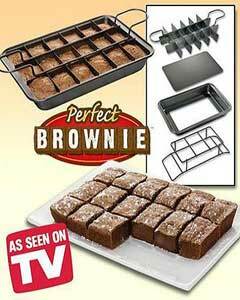 It’s great for brownies, snack cakes, cornbread, cereal treats and more! Pan is 11" x 7" and makes 18 brownies! The patent pending design of the Perfect Brownie™ Baking Pan has a non-stick surface and dividers to make perfectly square brownies every time. Plus, it cooks each piece separately so they are flaky and crispy on the outside, and rich and gooey on the inside.